Also for chopping, the lumbar can be held still. It's been tricky for me as well. The heel turning helps a lot there to open up the hips. The ab bracing isnt too taxing either, since the chops have more time between them in comparison to doing counter attacks at the table. That's a pretty extreme chop too! The picture is cut off but in the full one, his left foot is point out parallel to the edge of the table. It's not angled forward at all, which further backs up the feet positioning. You cant leave your toes aimed at the table and expect to reach that ball without lumbar rotation... his right foot often goes almost flat on the ground. That is, the instep of his foot is nearly touch the ground as if he were going to fall down sideways. well...it would be hard to justify the foot going in another direction than the upper leg's in the picture, it would be dangerous either way. I like your picture! I am no chopper: is it dogma that, when resting strongly on the playing leg for a bh chop, the foot should always be in line with the bent upper leg? Blah what do you think about Liu Song and the thoracic? To me it looks like his waist/belly button is always point forward in the direction of his hips. He doesn't ever rotate the waist across his hips. Hmm... then in this Liu Shiwen point at 1:58, it looks like pretty much only thoracic? I'm pretty sure not a single pro that's sort of well known (except for Harimoto )is employing the thoracic rotation, it's a pretty exclusive club at the moment! Karakasevic? When he is not lazy to do full backswing forehand, his elbow goes way behind. 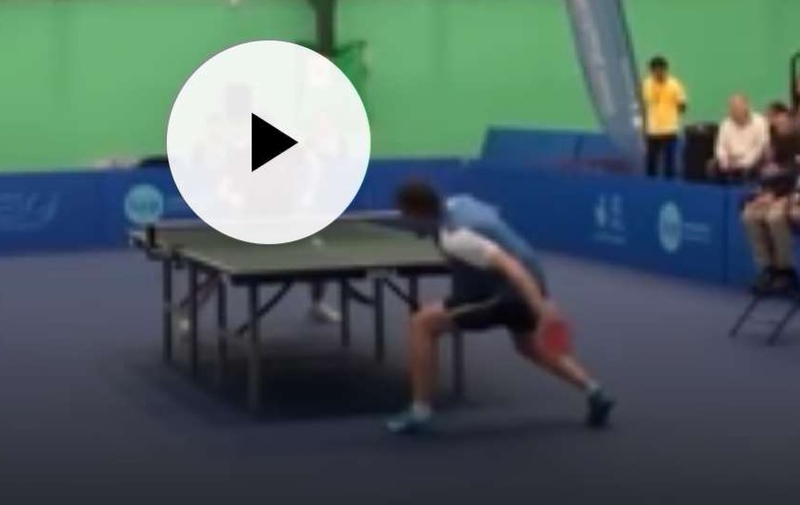 I'll be surprised if Kara doesn't have lower back problems with this kinda FH backswing, but maybe he doesn't do it often enough to cause problems unlike Waldner! I'm sure certain movements can worsen or hasten the lower back problems... but a lot of it seems to be genetic as well. I was watching some interviews and such a bit ago, where doctors were seeing 20 year old women with pretty badly injured lumbars -- and they had no exercise background or anything you'd suspect to be the obvious cause at such a young age. And then you have some lifters well into their old age still pumping iron, without any problems. Point being, much of the lumbar/back injuries were being blamed in large part on basic genetics. No reason to take your chances, though... work on the form/technique that gives you the least amount of pain/injury!! So we have 3 axis: one going through the hips, one through the waist, one through the shoulders. The 2 lower ones ideally stay together and always point to the same direction. The top one may travel further than the 2 lower ones, either way. Is that an acceptable simplification? Hi fatt, yes this is indeed the case to ensure that we're not hurting our lower backs! thanks a lot, I was off at some point, mixing the top 2 together. Adding the boxing analogy and the upper back safer rotation to explanations helped a lot to get the topic's big picture in simple words, again thank you for developing that topic, I feel like I understand the game better today and in a safer way. For all the players we know they were injured because they are famous, how many are suffering anonymously because that danger was not acknowledged earlier? I will definitely introduce this when I coach people 1 on 1 at my place. I wanted to say that with that 3-axis simplified model, I really feel like I learned something fundamental. Thanks a lot for that, it’s huge to me. WELL DONE BLAHNESS!!! Checking in to say the thoracic rotation club is still working great for me as well! No back issues at all since taking up the new technique. None when chopping either. I think the backhand chop had been the real killer for me previously. Lunging sidestep with a complete lumbar twist... ow! I have a 20's friend who came from Chinese TT sports school, he already has regular lumbar pain but also refuses to change his technique even after he agreed with me that waist rotation/bending is the key issue there! For me I use my belly button as a point of reference, if that moves relative to the hips then waist rotation is being used. Also the love handles should not be compressed or twisted in any way if you're not using your waist. Same thing I had. Guy complains about back pain every session, tried the thoracic technique for a few weeks of learning, was not able to learn it so reverted back to mr. Back pain! Another person who emphasizes the thoracic a lot is pro strongman Martins Licis. When watching his videos he always says do not bend from the lumbar, go from the thoracic. The thoracic technique might be a nice add on, but the hips are more important. Using the hips makes it hard to mess up the technique and use the lumbar spine. Using the thoracic rotation is closer to the lumbar rotation and one might still use lumbar rotation on accident. Using the hips is the best thing to do. I'm saying this because I see a lot of posts about thoracic rotation on here, but not about the hip use. So instead of rotating and coiling the torso like ZJK which I believe is quite damaging to the lumbar, I'm switching to Harimoto's method where there is minimal lifting of the elbow and no torso rotation. I feel that the arm has to do more work in Harimoto's version, but throwing the arm forward like a punch also creates quite a lot of power.